Tripti Nadakar is a Nepalese film actress. Tripti has performed in more than a dozen Nepali films. Her hit movies were Samjhana, Kusume Rumal, Saino and Lahure. She and Bhuwan K.C. were dubbed the first golden couple of Nepali film industry. Tripti Nadkar came from a family of directors and film makers. The actress made her first television appearance when she was just two years old. The innocent toddler actress was featured in various advertisements like Nirma washing powder, Zandu Pachan Shakti, gripe water and other products. After success in advertisement she also did modeling and acting in documentaries. Tripti made her debut in big screen cinemas in a Marathi movie when she was eight-years-old. Tripti had managed to gain fame in Gujrati and Marathi movies before acting in Nepali movies. In Nepali movies, Tripti debuted in ‘Kusume Rumal’ when she was fifteen-years-old. At the age of 16 she already had two blockbuster movies an a huge fan-base. Tripti was featured in successful movies like ‘Samjhana’, ‘Koseli’ and ‘Lahure’. The director Tulsi Ghimire is credited for introducing Tripti in Nepali movies and he is also Tripti’s uncle.Tripti took a break from acting in 1988 after finishing Nepali movie ‘Koseli’. After that she remained full time housewife and mother for the next 17 years. Tripti’s father met her mother, a singer, while he was posted in Darjeeling. They got married and Tripti was the only daughter of her parents.While shooting for ‘Bhar Chha Bhedi’ in Rajkamal Studio, her uncle Tulsi Ghimire and Shambhu Pradhan proposed her to play a Nepali movie.Tripti didn’t have any affairs and she did an arranged marriage. She was engaged while shooting ‘Kusume Rumal’. Her husband did export-import business. She got married while shooting ‘Saino’. While doing ‘Koseli’ Tripti had already given birth to the elder son. While shooting of ‘Koseli’ Tripti felt guilty of leaving her son alone and working while he cried. So, she decided to retire from acting and become a full time mother. After leaving acting Tripti started learning and teaching dance while tending her two sons. When her elder son grew up, he took over Tripti’s dance class.Now the elder son of Tripti is running a dance institute in Mumbai and studying in Multimedia. 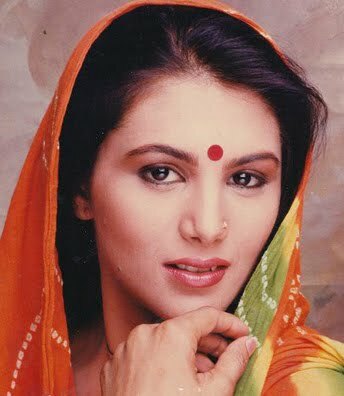 The younger son is still in school and has worked in a number of advertisement and television serials.At the time she left acting, Tripti had decided not to do any movies in life. But, when the director of the movie ‘Aamako Kakh’ presented the script of the movie to Tripti, she accepted it and returned to acting.Tripti is a very good and beautiful Nepali actress but, she can’t speak Nepali properly. She has Hindi and Marathi ascent. That was the reason all the movies from ‘Kusume Rumal’ to ‘Kosheli’ were dubbed by Bharati.She says, when she talks in Mumbai, she adds Nepali in-between and when she talks in Nepali she adds Hindi and English in-between. Tripti’s mother Mayadevi had also acted in movies with Tripti. In Kusume Rumal, Mayadevi was featured as the villain’s mother and in ‘Samjhana’ she was featured as Tripti’s mother.It was not only her mother, her father had also acted in ‘Samjhana’. He was featured as the doctor in the hospital in the movie.Tripti was paid Rs. 150,000 to act in ‘Saino’. That was two decades ago, and there are still a very few actress who get that much money for a movie.